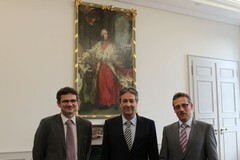 On 15 April 2013, the Mayor of Bonn welcomed the new Director for Research of BICC (Bonn International Center for Conversion) who was accompanied by the Director for Administration, Michael Dedek, at Bonn Town Hall. The continuation of the good cooperation between the center for peace and conflict research BICC and the City of Bonn was the main topic of conversation between them. Already in 2004, on the occasion of BICC’s 10th anniversary, did the Center become Bonn’s partner organization for that year. Professor Dr. Schetter is not only Director for Research at BICC, one of the world’s leading think tanks, but also holds a professorship for peace and conflict research at the University of Bonn. Bonn and BICC have already identified a number of linkages that fit the profile of Bonn as UN City and City of International Research and that can contribute to its further development.